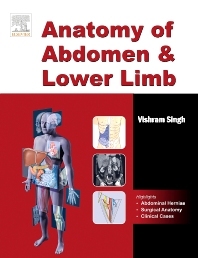 This volume faithfully follows the syllabus of Anatomy recommended by the Medical Council of India. It covers in detail the anatomy of lower limb and abdomen. Following recent trends of anatomy education, the book in addition to basic information, provides knowledge on anatomical/embryological basis of clinical conditions through its features of Clinical correlation and Clinical Case Study. Written in simple and easy-to-understand language, this profusely illustrated book provides knowledge of anatomy without extraneous details---ideal for undergraduate medical and dental students. The meticulously designed, accurate, simplified and easily reproducible four-color illustrations form a unique feature of this volume. With the wealth of relevant knowledge it is highly recommended for those preparing for various entrance examinations, like PG entrance, USMLE, PLAB, etc. Surgical anatomy of abdominal viscera also discussed.